Simple enough to work with any bedroom decor, but with a natural warmth and charm to really make a statement, our stunning Medford Bed is sure to make a cozy addition to any suite in the home. 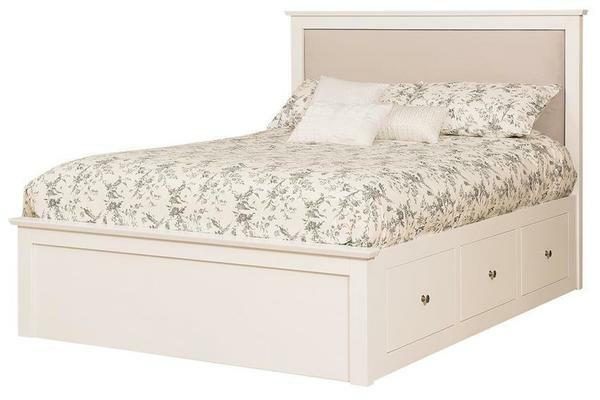 Crafted with a quaint design, offering clean lines throughout the headboard and footboard, this bed looks great painted (as shown) or in a hardwood and stain finish combination. The large 53" tall headboard boasts a spacious panel that can be customized with your favorite fabric, offering a plush headrest where you can prop pillows for reading or watching television before you head off to sleep. Below, six spacious drawers line the platform base, flush mounted to create a seamless look throughout. Here, you'll find deep, dovetailed drawer boxes that are perfect for housing space bedding, linens, or any other bedroom item that you'll need close at hand. The finished footboard provides a matching look to the headboard and caps off the piece to create a wonderful centerpiece for your suite. When it comes to finding the right piece of furniture to match your existing pieces, or one that really stands out, you can spend hours driving from store to store, hoping someone has the same tastes as you - or you can stay home and let us help. Our Medford bed is available in a wide variety of sizes, hardwoods, and finish options to help you find the perfect piece for the room you're refurnishing. And, if there was something that you'd prefer that we don't show, that's no problem. Just give us a call and speak with one of our furniture specialists today to request a free custom quote. Toll-Free (866) 272-6773.